"A Deer Story Of Deceit"
It was a Thursday, September 27, 2012 when I heard a text message come to my cell phone. I recognized the number as a friend if mine from th Northern Tier. He had sent me a photo of a buck taken near the Watertown area and after just a quick glance I could see it was a beauty. It was big non-typical and as nice a rack as I've ever seen in my years as a NYS Big Buck Club Measurer. That afternoon I called my friend to get the skinny on this big non-typical. He said he knew the hunters brother and the buck was taken that morning, which was the opener of the early season archery that allows hunters to use their unused archery tag from the previous year. I asked if he would get me the info and some more pics for my website. He said he would do his best. Wayne Long from Jefferson County put this hog down this morning (northern zone opener). 23 scorable points, scored at the taxi at 226 5/8. B&C has scheduled a scoring session and if confirmed it will crush the current record!" The next post was to me persoanlly asking if I had heard anything about this monster buck. I posted that I had recieved the pic the day before and was waiting to hear from the hunters brother. From the forum I quickly went to the New York Antler Outdoors website and facebook page to post a picture and what little information was known about the buck. After posting the photo on facebook one my fellow measurers at the NYS Big Buck Club sent me a message saying that Matt Cooper, a Lewis County measurer and Vice President of the Big Buck Club, was scoring it that evening. I quickly called Matt to see if I could get more info on the buck. When Matt answered I asked if he was scoring the buck and he said that he had scored it earlier that day. His next statement totally took me by surprise. He said "We won't be entering in the record book because I'm 99.9% sure it is a high fence buck". And so started the Deer Story of Deceit. There will be no spot in the record books for Wayne N. Long II, a Watertown hunter who claimed to have killed a state record buck in Rutland Corners on Thursday. Instead, he received a ticket Tuesday from the state Department of Environmental Conservation for filing a false statement. Mr. Long claimed he bagged the non-typical deer, which recorded a Boone and Crockett score of about 220, while hunting in the town of Rodman on property belonging to a family friend. The state record score in the category is 210 and 4/8. But officials of the company that certifies rack sizes said they believe he shot the deer on a deer farm, then took the deer to Rutland Corners, where he was photographed with his prize. When called Tuesday afternoon by a Times reporter about the challenge to his story, Mr. Long denied receiving a DEC ticket, and hung up before he could be asked any other questions. The Boone and Crockett organization, along with several hunting associations and clubs across the state, refuses to acknowledge farm-raised deer for its record books. In a position statement on its national website, Boone and Crockett says it opposes the practice, also referred to as a canned shoot, because it affects the relationship between predator and prey. Matthew J. Cooper, a local scorer for Boone and Crockett and vice president of the New York State Big Buck Club, said he realized something was amiss when he was called by Mr. Long to measure the deer at Wilderness Walt’s Taxidermy, 10641 Station Road, Lowville. Mr. Cooper said hunters will “periodically” enter an ineligible deer for record attempts. Measuring the buck Friday afternoon, Mr. Cooper asked to take the deer’s lower jaw, which can be used to estimate its age. He said he determined the deer was about 2 years old, which he felt was not old enough to have naturally developed that size of antlers. Suspicious, Mr. Cooper then had Mr. Long take him to the reported kill site, off Jacobs Road. Mr. Cooper was surprised when Mr. Long told him the deer fell about 30 feet after being hit. Mr. Cooper said most deer hit by an arrow travel 50 to 100 yards before falling. “They have to bleed to death,” Mr. Cooper said. He said there was no blood near the area of the deer’s reported death. “The kill site was unrealistic,” Mr. Cooper said. He said he was able to learn enough by Friday evening that he could tell Mr. Long that his deer was farm-raised, and as a result would not be eligible. Mr. Cooper said he gave Mr. Long two options: Either remove the record attempt request or he would be forced to prove publicly that the deer is ineligible. Mr. Cooper said Mr. Long told him he would withdraw his request. Mr. Long met with a Times reporter to talk about the deer late Friday afternoon, after the Times was contacted earlier in the day by his girlfriend, Mandy Petrie. Mr. Long also did not mention the questions about the deer’s eligibility when called by the Times on Saturday and Monday about submitting a photo. After a story about Mr. Long and his hunt was printed in the Times on Tuesday, Mr. Cooper said, he left a phone message for Mr. Long. Mr. Cooper received a phone message later from Mr. Long, telling him again he would not attempt to set a record with the deer. “He’s put himself in an awkward position,” Mr. Cooper said. A message left with the taxidermy shop’s owner, Walter A. Graf, was not returned Tuesday afternoon. An email message to Ms. Petrie on Tuesday afternoon requesting comment did not receive a response. Stephen W. Litwhiler, a DEC spokesman, said Mr. Long, 39, of North Pleasant Lane, was given the filing a false report charge instead of one for possession or transport of an improperly tagged deer, which are done mainly for hunters who make an error when filling out their tag. “This is not just a simple tagging violation,” Mr. Litwhiler said. Mr. Long also received a ticket Tuesday for third-degree operation of a motor vehicle without a license. The charges are answerable in Harrisburg Town Court. Mr. Litwhiler said Tuesday afternoon an investigation is ongoing. The story doesn't end there. Unfortunately the scoring clubs were not the only ones decieved here. Wayne immediately contacted his brother Mike to tell him of the monster buck he had taken, but never telling him the true story. Mike being a good brother was so excited that he decided to get the word out to anyone that would listen. 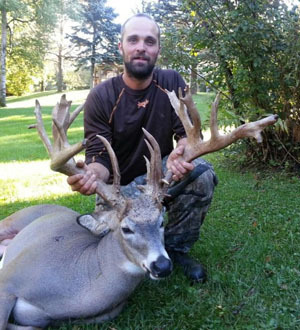 Soon the photo of a prospective New York State record whitetail was being sent everywhere. Hunters were itching for the story and I had it, but couldn't really tell anyone about it per the agreement made with Wayne long by Matt Cooper. Mike Long emailed me over the weekend to tell me that his brother was going to reach me to get the story and photos published on my website. I emailed back telling him politely that I was no longer pursuing the story of his brothers buck and that he really needed to speak to his brother because I was sure his brother had something he needed to tell him. Then I asked him when the last time was that he saw his brother. I was surprised to learn that his brother had not yet told him of the hoax since it had already been a few days since Wayne had agreed not to pursue the matter further. On Wednesday morning, October 3, 2012 I recieved an email from Matt Cooper with the link to the Watertown Times article telling of Mr. Long's charges by the DEC. It was kind of a relief not having to keep the secret in any longer. After reading Matt's email and reading over the article I went back to checking my emails and saw an email from Mike Long again. an idiot! I will see him this weekend and ask him the real deal." aware of.. hopefully everyone will learn a lesson from this and move on." And so is the Deer Story of Deceit... not only an attempt to decieve the recordbooks but a deception that extended to a proud brother looking to get the word out of what he thought was the buck of a lifetime.